“We made dog food!” my 3-year old excitedly proclaimed to his teachers! Well… not exactly. To a 3-year old, I suppose Puppy Chow could easily be construed as dog food because of it’s name. But as he helped pour and shake and cover the crisp little squares of cereal with chocolate and peanut butter, he knew better. 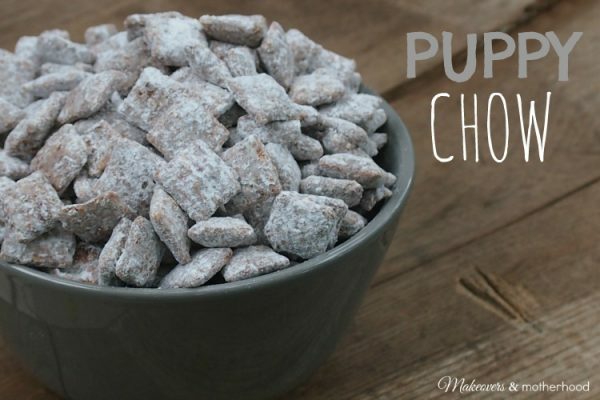 I remember having Puppy Chow a few times as a kid, but it wasn’t until I made it with my mother-in-law that it really caught my attention. Why? She gave me the job of shaking the bag. I’m not sure how other families make their Puppy Chow, but my MIL makes it in a brown paper bag… and now I do too. Maybe it was the bewilderment of making food in a paper bag. Maybe it was that I got to shake it (I do love to shake). Or maybe it was the sweet goodness that came out of the bag afterwards, but I thought this was awesome. 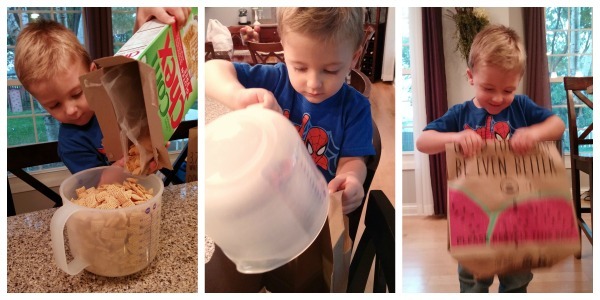 We “measured” our cereal out. Yes, I know the box is 12 ounces, just as the recipe states. But this gave little man extra practice with his pouring and the extra smiles it brought to his little face was worth the extra step. So we used my mother-in-laws recipe and then adapted it some… a little less butter, a little more powdered sugar (confectioner’s sugar). You can play with the amount of powdered sugar too. You could start with just 1.5 cups of confectioner’s sugar, shake, and decide if you want it coated more. Somehow my batches never seem to get coated as well as my MIL’s so I upped the recipe to 3 cups. Thanksgiving — Add Reese’s Pieces to it for a great turkey day treat. Christmas — Red and green M&Ms will make this quite a festive finger food for those holiday gathering. Fourth of July — Add red and blue M&Ms and BOOM!, this snack is exploding with patriotism! So get in the kitchen and get shakin’… literally! Crunchy bites of chocolate and peanut butter powdered with even more sweetness! Place cereal in paper bag. Add powdered sugar to bag and shake well. Happy shakin’ and happy eating!